ive been trying to finish a fully signed base set of score 2013-14 since it came out. I’m looking for the following cards, base set (white border) hand signed to finish the set. Thanks in advance. I moved your needs list to the Buy/Sell section of the forums. Hopefully you can finish this awesome project soon. 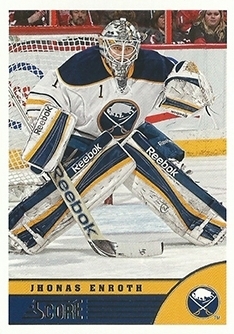 If you happen to have an extra copy of the Jhonas Enroth signed Score base card, I'd love to add it to my own collection.